Social networking has spread around the world with remarkable speed. In countries such as Britain, the United States, Russia, the Czech Republic and Spain, about half of all adults now use Facebook and similar websites. These sites are also popular in many lower-income nations, where, once people have access to the internet, they tend to use social networking sites. 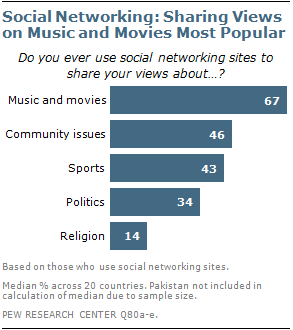 A survey of 20 countries conducted last spring by the Pew Research Center’s Global Attitudes Project found a median of 67% of social networkers say they use these sites to share opinions about music and movies. Significant numbers also post their views on community issues, sports and politics. Significant numbers also post their views on community issues, sports and politics. Fewer give their opinions about religion.